During the Civil War (1861-1865), whereas William Thomas would be subjected to three court-martials, Alfred Jackson would be deemed unfit for command. President Davis insisted that Thomas' court-martials were "disingenuous and destructive to the Confederate cause." Related to Thomas by marriage, Davis would not hesitate to countermand each punitive measure leveled at Thomas, who served in dual capacity as Cherokee chief and Confederate colonel during the conflict. Jackson meanwhile would be known throughout the Confederacy as "Old Mudwall," a disparaging nom de guerre assigned by the very men he commanded. Both mountain men were in their mid-50s and neither had served in the military when they answered the call of the newly formed Confederate States. Financially successful, the self-made men, and former slaveholders, were citizens of two homogenous mountain regions known as East Tennessee and Western North Carolina. Reminiscent of sibling rivalry, these two alpha males would become embroiled in a command dispute that would eventually demand intervention from Richmond, the Rebel capitol that housed none other than Davis, the Confederate President. As the winds of war gradually ceased, both, now physically and emotionally infirmed and financially in ruins, sought to recover their fortunes during their twilight years. William Holland Thomas, aged 88, would pass away on May 10, 1893, the exact date that his cousin Davis was captured while fleeing the Lost Cause in 1865, and the date that "Stonewall" Jackson was accidently shot and mortally wounded by his own troops in 1863 while at Chancellorsville. Alfred Eugene Jackson would live to be the eldest citizen of his community when, on October 30, 1889, he died at age 82. With merely an introduction, the sobering facts show that these two Southerners had much more in common than not. Two fifty-something alpha males and just one opening for Confederate commander was the setting that Colonel William H. Thomas and Brig. Gen. Alfred E. Jackson would contest during the American Civil War, but since neither man would acquiesce, the fallout would demand a response from Richmond. Prior to the war, Tennessean Alfred Jackson was a slaveholder, prosperous farmer, and rising transportation tycoon but he had never even donned the military uniform. North Carolinian William Thomas was a boy when he was adopted by the prominent Cherokee Chief Yonaguska, who would later appoint Thomas, now a self-taught lawyer and Indian Agent to Washington, as successor Chief of the Eastern Band. His mother would become widow just months prior to the birth of William, and although she was related to President Zachary Taylor, her son Little Will, as he was known by the Cherokee, would be raised in obscurity. 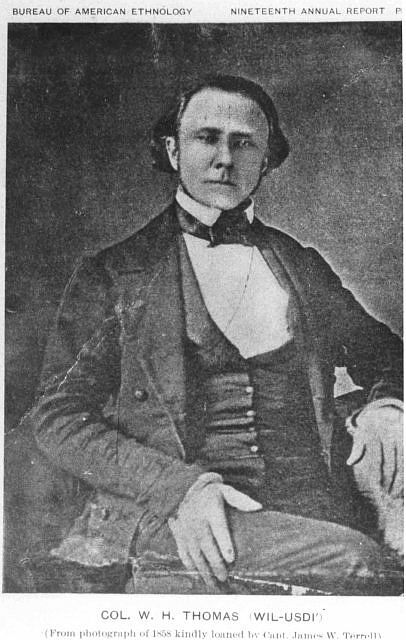 By the 1840s, however, Thomas rose to prominence while serving as both state senator and Chief of the Oconaluftee, but he too had never served in the military when he volunteered his services by submitting plans to raise an army that would only be used to defend the Tar Heel State against any armed incursion by Federal forces. Although Thomas' uncompromising Civil War strategy would be the basis for his many court-martials, the colonel enjoyed a unique status with President Jefferson Davis, because through his Strother lineage he was cousin to Sarah Knox Taylor, the daughter of President Zachary Taylor, and she was married Davis until her untimely death caused by malaria. In the summer of 1863, while assigned to Jackson's brigade, Thomas was arrested and awaiting court-martial. Whereas Thomas' Legion had been reorganized into Jackson's Brigade, the command generally consisted of Thomas' Legion only. (O.R., Series 1, Volume 29, pt. II, p. 812, O.R., 31, 1, p. 454, and O.R., Series 1, Vol. 33, p. 1137). Was it a legion but brigade in name only, as some of the legion would argue. Why was the legion taken from Thomas and then veiled as a brigade under Jackson. This confusing command structure was highly contested, so Jackson had Thomas arrested in June of 1863 and charged with "disobedience of orders." Thomas was sent to Knoxville to await trial, but Union General Burnside's East Tennessee invasion intervened thus postponing the trial. Inept decisions by headquarters with the problematic command structure would chip away at the unit's morale and even lead to desertion, and while Richmond vacillated on taking any action on the subject, its generals would have the audacity to complain about the appearance and thinning ranks of this so-called brigade, but meanwhile, the soldiers of the legion were vacating their muster station in East Tennessee and returning to North Carolina where they would serve and defend the home front. 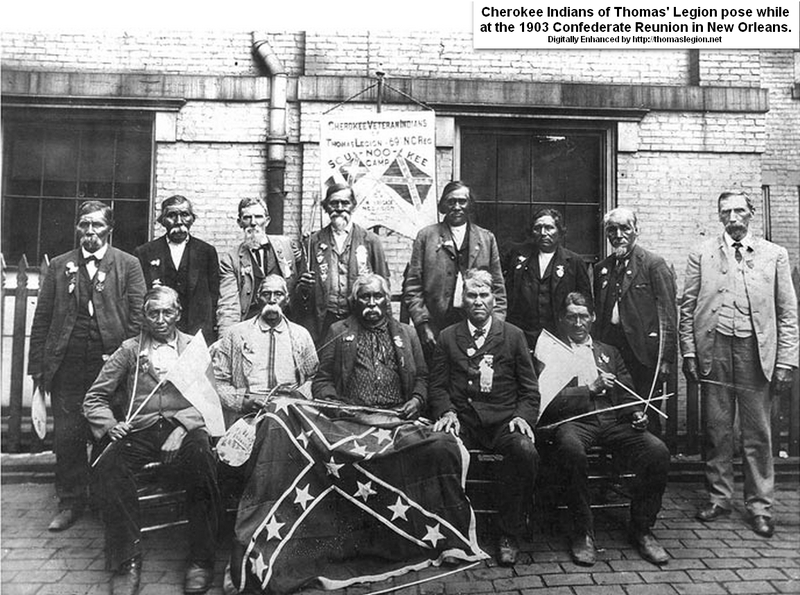 By the summer of 1864, orders were at last issued for the infantry regiment, of the Thomas' Legion, moving it into the action of the Shenandoah Valley before reassigning it to Thomas, who would remain in North Carolina with his Cherokee Battalion. Prior to the Civil War, Thomas and the prominent Vance family of North Carolina were often on opposing sides of legislation, and while they espoused dissimilar views on subjects ranging from the ad valorem tax to senate railroad bills, the conflicting political positions would merely carry over and become more intense during the stresses of war. Another court-martial for Thomas was to occur on February 23, 1864, because of the capture of Brig. Gen. Robert B. Vance, brother to Governor Zebulon Vance. Leaving Colonel Thomas at Gatlinburg, Tennessee, Gen. Vance had proceeded to Sevierville and was captured because he failed to post pickets and not as a result of Thomas disobeying orders. Although Vance would remain in a Federal prison until the war ended, he would later concede that his capture was a misunderstanding of orders. Concerning the capture of Brig. Gen. Vance, Colonel John B. Palmer stated that Lt. Col. James L. Henry, and not Thomas, should be court-martialed. (O.R., Ser. 1, Vol. 32, pt. 1, p. 76). 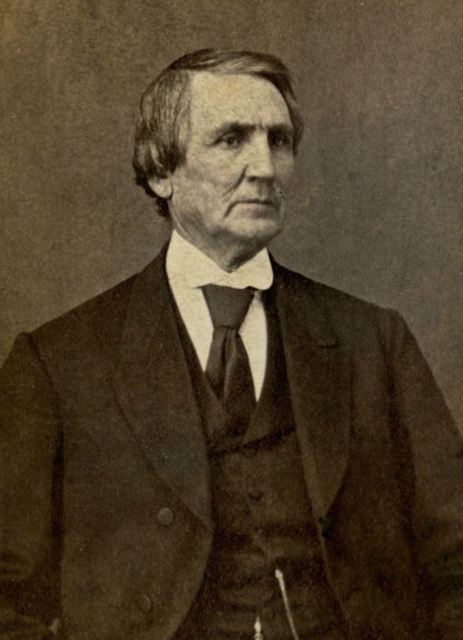 Confederate Secretary of War James Seddon believed that Vance was partially responsible for his own capture, and President Davis, receiving updates on the subject, wrote that "no action is practicable which seems proper." (O.R., 32, 1, p. 77). On behalf of Thomas, Davis intervened and having the charges dismissed, there would be no trial. Official records and reports also show that Thomas was not responsible for the capture of Robert Vance, but the governor insisted otherwise, stating that there was culpability while referencing Thomas, and he was determined to use his brother's capture as an opportunity to punish his nemesis. Zeb Vance would serve as North Carolina's Governor for much of the war (1862-1865 and 1876-1878) and later in the U.S. Senate (1879-1894), making him one of the most prominent political figures in the history of the Old North State. On May 11, 1864, Thomas was charged with receiving and adding to his unit some deserters from the 65th North Carolina between September 1863 and April 1864, but on this occasion, General Jackson was relieved of his command for health reasons and reassigned to the Army of Tennessee, and Thomas appeared to have avoided another court-martial. In October 1864, the trial resumed and Thomas was indeed found guilty of all charges. This court-martial had combined a prior court-martial with four additional charges, but the colonel responded the way he had to previous charges when he appealed to Davis, who merely reversed the charges. "Old Mudwall" Jackson would be assigned to staff duty on November 23, 1864, and serve the remainder of the war without a command. But the Thomas Legion saw its infantry regiment detached and assigned to Jubal Early's Army of the Valley during the summer of 1864, where it fought many battles with large Union armies, before it was ordered back to North Carolina and reassigned to Thomas who had been commanding the Cherokee Battalion and involved in few pitched battles but many skirmishes with guerrillas and bushwhackers. 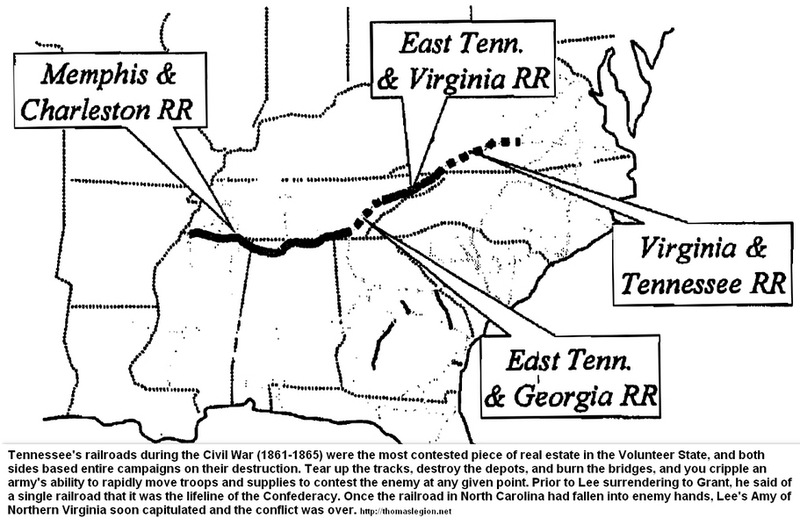 (About) In East Tennessee there was a single railroad that meant the difference in transporting men and equipment between the theaters of the war -- and it had to be defending at all hazards. Involved in transportation and understanding the importance of logistics, Brig. Gen. Alfred Jackson, with scare resources, gave great efforts in defense of the region's railroads. In the theater of the brigadier's operations there was a good deal of detachment work in which there was plenty of marching and fighting, but very little chance for renown, because the great battles of the war so obscured the small affairs that in many parts of the country they were never even heard of. There are just a few documents showing "Thomas’ regiment, North Carolina" or "Thomas’ regiment, North Carolina Volunteers," and though Jackson's Brigade is discussed below as it appeared on one occasion, April 20, 1864, notice at the bottom of the page that the Official Records of the Union and Confederate Armies adds a footnote and records that the units forming Brig. 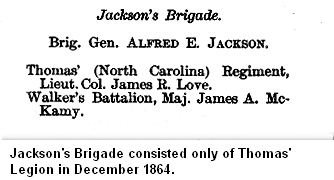 Gen. Jackson's command were "otherwise known as the Thomas (North Carolina) Legion." While Levi’s (Virginia) artillery battery is mentioned it was, however, also part of the Thomas legion, and on this occasion Burroughs’ and McClung’s Tennessee batteries were temporarily assigned to the organization, but Jackson's Brigade was generally composed only of elements of the Thomas Legion. When viewing the components of the brigade, it included all the components of Thomas' Legion, and only Thomas' Legion, but Jackson couldn't use the word legion when referring to any portion of the command, because then the brigade itself would no longer exist. (See also Thomas' Regiment in O.R., Series 1, Volume 33, p. 1137.) The following has been transcribed from Official Records of the Union and Confederate Armies, Series 1, Vol. 32, Part III, 802, with original text, spelling, and footnotes. Brig. Gen. Alfred E. Jackson. Thomas’ regiment,++ Lieut. Col. James R. Love. Walker’s battalion,++ Lieut. Col. James A. Mckamy. 17th Tennessee, Col. R. H. Keeble. 23rd Tennessee, Col. R. H. Keeble. 25th Tennessee, Lieut. Col. John L. McEwen, jr.
44th Tennessee, Lieut. Col. John L. McEwen, jr.
63d Tennessee, Col. Abraham Folkerson. Detachments, + Capt. Nathan Dodd. Brig. Gen. Archibald Gracie, Jr.
41st Alabama, Col. Martin L. Stansel. 43rd Alabama, Lieut. Col. John J. Jolly. 59th Alabama, Col. Bolling Hall, jr.
60th Alabama, Maj. Hatch Cook. 23rd Alabama, Battalion Sharpshooters, Maj. Nicholas Stallworth. + From the Sixteenth Georgia Battalion and the Third, Thirty-first, Forty-third, Sixtieth, Sixty-first, and Sixty-second Tennessee Regiments. • As shown by inspection reports of Lieu. Col. Archer Anderson, assistant adjutant-general. Jackson’s brigade at Carter’s Depot, the others near Zollicoffer. Sources: Official Records of the Union and Confederate Armies; Walter Clark, Histories of the Several Regiments and Battalions from North Carolina in the Great War 1861-1865; National Park Service: American Civil War; National Park Service: Soldiers and Sailors System; Weymouth T. Jordan and Louis H. Manarin, North Carolina Troops, 1861-1865; D. H. Hill, Confederate Military History Of North Carolina: North Carolina In The Civil War, 1861-1865; Vernon H. Crow, Storm in the Mountains: Thomas' Confederate Legion of Cherokee Indians and Mountaineers; Vernon H. Crow, The Justness of Our Cause; E. Stanly Godbolt, Jr. and Mattie U. Russell, Confederate Colonel and Cherokee Chief: The Life of William Holland Thomas; The Civil War Diary of William W. Stringfield, Johnson City, TN: East Tennessee Historical Society Publications; and John R. Finger, The Eastern Band of Cherokees.